A’s bottom left lateral incisor emerged, so that makes tooth #7. She’s been understandably out of sorts this week. One day, she was on edge and easy to startle and upset (but fortunately, also easy to soothe). 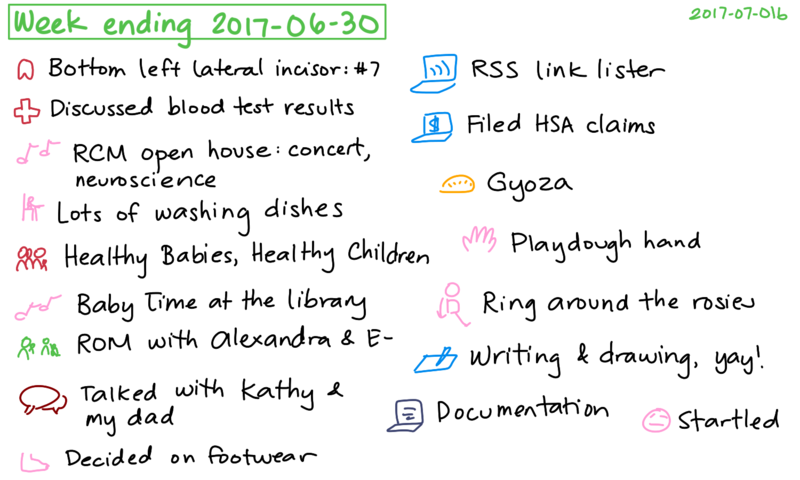 She was also not keen on being at the doctor’s office to discuss the results from her blood test, but ah well, these things are important. She was pretty relaxed for the Healthy Babies Healthy Children visit, though, which probably helped the nurse and the home visitor think we might be ready for discharge sometime soon. For our next activity, Nilda suggested making hand-print casts out of plaster of Paris by using playdough molds, so we might try that next week. Our music classes wrapped up for June. I wrote a reflection on how that was different from drop-in circle times. I liked it enough to sign up for July sessions as well as the fall term starting in September. We enjoyed the open house at the Royal Conservatory of Music, too. A- attended her first concert, and we also attended a brief presentation on the neuroscience behind the music classes she’s taking. We made it to baby time at the library, too, and I got a ukulele songbook from the librarian. Looking forward to learning more nursery songs, especially since A- enjoys things like Ring Around the Rosies. A- was interested in washing dishes this week. She often dragged the chair over to the sink so that she could stand on it and “wash” the dishes. It took me much longer to wash dishes with her help, but it was fun to get her involved. I invited Alexandra and E- to the ROM. As usual, A- and I spent most of our time in the discovery wing, and a little time in the biodiversity area. A- was fascinated by chairs, benches, the bird exhibits, and the tiger. We decided on our footwear policy for A-: barefoot as much as possible, socks if they seem like a good idea, shoes if necessary. I used some of my discretionary time to code an RSS link lister for making Emacs News. I also filed a few health spending account claims – good to do a bit of paperwork here and there. I picked up chives from PAT Central, and we went on a gyoza-making kick. Yummy! I chatted with Kathy and with my dad about feeding kids, passing on some of the tips I picked up from research. Lots of writing and drawing this week! 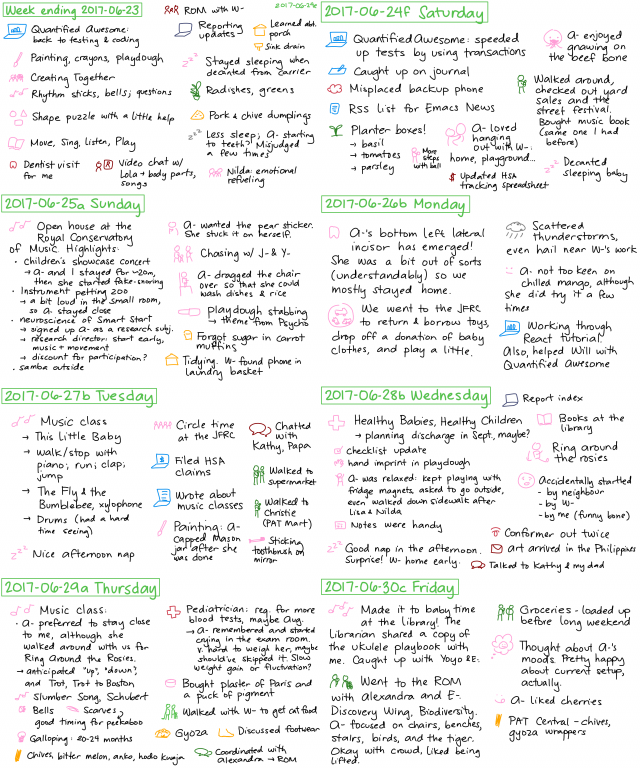 I like organizing my thoughts. It helps to take an afternoon nap along with A- so that my mind can be somewhat fresh after she goes to bed for the night.